Great ski backpacks (and a ski bag) from Kulkea and Transpack. When it comes to ski gear, I’m all about “grab and go.” This is especially true for keeping my kids organized. Starting at the bottom with ski or snowboard boots, here’s a rudimentary list of what you might need each and every ski day. Now, you may not need each of these items every day, and your kids may not care if they have sunglasses for après ski, but most likely you’ll need and be using most of these items this ski season. Will it all fit? It will! 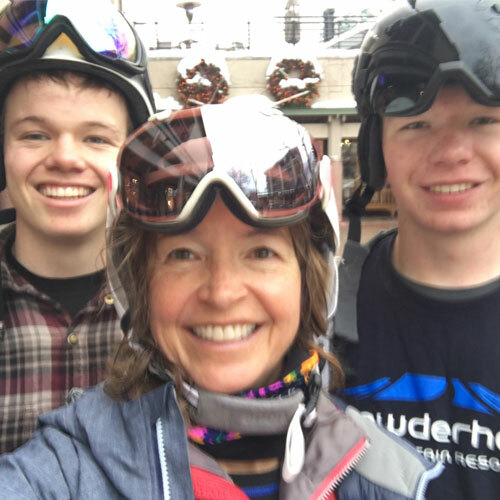 Skiing and snowboarding can be a hassle, especially for moms, because of the packing and organizing that goes into a day trip, a weekend or a week-long vacation. It’s a lot of work. Sometimes it seems easier to grab your bikini and go to the beach. But while the beach is fun, if you enjoy skiing, the hassle factor can be eliminated. It all comes down to having a list (see above) and the proper boot bag. After 14 years of family skiing, and lots of different ski bags, we prefer backpacks or rolling bags to anything that a gloved hand, large or small, has to carry. A backpack for the organized mom or dad, the Kulkea Boot Trekker is designed with efficiency in mind. There truly is a place for everything. Large side pockets hold one ski boot each and are on the outside of the bag to keep the boots from banging you in the spine. A flip down front pocket has a furry pouch for your goggles, and room for lunch and water. A small front pocket stores little things like lip balm and sunscreen, while your gloves find a home in individual glove pockets on each side. A stowable sling pops out and snaps into place to tote your helmet, and a large central compartment holds everything else! Best of all, in a really nice touch, the back is padded and contoured and very comfortable. The Boot Trekker is a big bag, definitely sized for adults. With this bag, mom or dad can carry most everything and still walk hand-in-hand with a child to the lodge. GOOD FOR: Adults who like to be organized and want a bag where they (or their kids) can find exactly what they need, exactly where it should be. There will be no rooting around looking for chapstick or mitten liners with this bag. Excellent for day trips and car trips, but less suitable for checking at the airport because of the external helmet sling. Another great backpack option, Transpack is wonderful for families because their bags come in different sizes to fit kids, moms and dads, all with similar features. Each pack has padded straps and Transpack Isosceles Storage System, which puts the weight of the boots onto your sides rather than in the middle of your back. This makes it easy to carry a loaded pack for anyone about 8 years and older. Second, they are surprisingly roomy and efficient. While these bags range in size from the 3300 cubic inch TRV Pro to the 2000 cubic inch Edge Junior, they all have plenty of room for boots, helmet, goggles, gloves and more. External pockets are a good place to put passes, sunscreen or other small items. While there are two small internal pockets in the main storage compartment. As for sizing, our kids began using the adult bags when our youngest was 11, but he’s pretty sturdy. For a smaller child, I’d definitely start with the junior bags. Other options include drawstring or full-zip closure, travel models with stowaway straps, and bags with external helmet storage (most of them have internal helmet storage). Transpack packs also come in a variety of solid and patterned heavy-duty nylon. GOOD FOR: Junior skiers and adults who fly to their ski destinations, day trippers and car trippers, too. The larger TRV Pro bag may be more than you need for a day trip, but comes in very handy when you’ve got a lot to pack. These are good all-around bags that you can cram to capacity. Need to travel with your skis? Check out Transpack’s ski bags. Transpack’s ski bags range from a hard case that holds up to 2 pairs of skis or 2 snowboards, to heavy-duty soft-sided bags for one or two pairs of skis. We’ve got the wheeled, easy-to-roll Ski Vault Double Pro, a sturdy bag with internal dividers and straps to securely hold two pair of skis. A telescoping top lets you pack longer skis and provides a bit of extra room if you need somewhere to stash your coat. For those who don’t like backpacks, this rolling bag from High Sierra has boot compartments on both ends and a roomy center compartment as well as side pockets. This means families with younger kids can pack boots and gear for one parent and one kid in one bag. Then, because the bag rolls easily, a child can pull the bag, while a parent can schlep the skis and poles. We used these bags when our kids were little ski racers and our youngest son would unzip the large compartment and stuff his skis and poles into the bag with the tips hanging out. Since he could pull this himself, it freed up my hands to carry my gear and the lunch. Large and roomy, these bags can take you to the slopes or to the airport, with enough space to pack your ski gear and off-mountain clothing for a long weekend, or even a week-long vacation. GOOD FOR: People who don’t like backpacks and smaller children who can pull a bag. Excellent for travel near and far, if packed carefully (and sparingly), it’s the only bag you’ll need to take. Because I’m all about grabbing and going, we’ve found the best strategy for staying organized is to repack our bags after every ski outing. This means drying our boots, washing anything that needs it and then putting everything back into the boot bag. At the end of the season, we follow the same routine and ski boots and gear are stored over the summer in the boot bags in our closets. Come winter, no one needs to think twice: it’s grab and go. What tips do you have for staying organized during ski season and eliminating the “hassle factor”? Any bags you’ve found that work exceptionally well? Everyone Carries Their Own Gear: Transpack Bags, December 7, 2011. Ski Fashion on the Go: The SkBoot Bag, November 14, 2011. Ski Fashion: Packing Light and Looking Great, January 9, 2012. All That You Can’t Leave Behind, Part One, November 10, 2010. © 2013 – 2019, braveskimom. All rights reserved. Any use or publication of content, including photos, requires express permission.